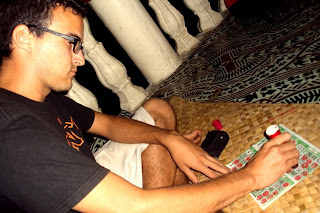 Matt's Samoa Blog: Cultural Exploration 27: Bingo! Despite the weekly bulletin an- nouncements, my family never attended church Bingo back in The States. In fact, the only time I ever interacted with church Bingo was at Our Lady of Grace religious education fundraisers, which was called by Bubbles the clown. 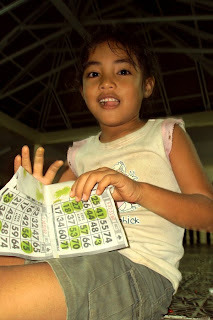 Beyond that, my Bingo experiences are of the secular variety, playing in elementary school and Spanish classes and such. I’ve never “made it interesting,” so I have no real baseline to compare. But in Fausaga on a Friday night, church Bingo is the place to be. Most Bingo attendees are women. 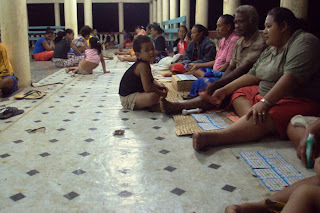 Occasionally a husband shows up to play, but for the most part, the fale is filled with older women, younger women, and girls. The church treasurer, who is male, sits at the front collecting money, a man goes around distributing the bingo papers, and I’m there playing the role of the token charming palagi. The games are tense and have a cut-throat feeling to them. Money is scarce in many families, and a Bingo win can be a big deal. 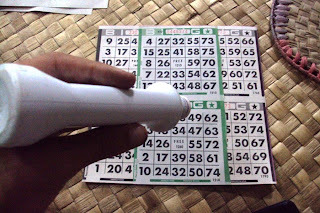 Bingo is also a game built solely on luck; sure, it requires skill to quickly find and mark the numbers and to recognize when you have Bingo, but beyond that, it’s a lottery. In my opinion though, the tensest aspect is the Bingo caller. In order to allow for all the women in the village to play, a girl, somewhere around 12 years old, normally calls Bingo. The girls tend to go fast, and each caller tends to have her own style. The Samoan number system allows for variation and abbreviation. For example, the number “54” might be lima sefulu fā, lima fā, or lima ma le fā. That is fifty-four, five four, or five and the four. Sefulu, the word for 10 and also the suffix signifying a multiple of 10, can be abbreviated sulu or fulu. So with all these variations, Samoan Bingo can be quite a challenge for the novice speaker. After the third hour, my brain is reeling. The role of Bingo night in the community is palpable though. Ladies laugh and gossip between rounds, children from the village play outside, women sitting next to one another compare cards from the last round and stories from the week before. 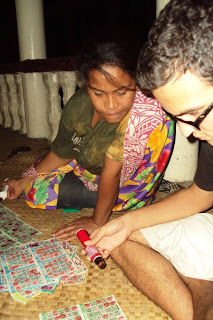 Bingo is the lifeblood of modern Samoan collectivism. And I don’t mind being the token charming palagi. If nothing else, I get to practice my numbers. Attendees at EFKS Friday Bingo in Fausaga. Akanese does origami with finished bingo sheets. Often such sheets are used for toilet paper, no joke. Asolima keeps an eye on my sheet when I play. Bubbles the Clown will be so happy to know she made it into your post. And...you were most kind. I loved reading about Bingo. It sounds like such fun! Greetings from France! We can read your blog from our hotel room in Lyon. Very cool! B lua i le N fasefulu....BINGO!! too funny Mataio. too funny. Oh the memories of Samoa. Its always interesting to hear of the Samoan culture from a Palagis or Pisikoa's view. It really makes a good reading. Keep it coming Mataio. Bingo is gambling, it's a waste of money and time. B.I.N.G.O!!.. even the locals have become soooo poor because they've rather put their money into gambling winning nothing than put the money where the mouth is.. ha ha ha.. I've tried it before but guess Im not a gambler.. but nice try Matt.. getting the hang of it aea? good luck next time though!